I love vegan and vegetarian cooking. I will admit that I eat fish now but for a long time, I was vegetarian for over 10 years and vegan for 3 years. My hubby knows that I’ve been eager to try a cooking class but will talk myself out of it because it’s expensive, I’m busy, or whatever lame excuse I have. So for Christmas he got me a gift certificate for a vegan organic cooking class of my choosing (and I could bring a guest) from Spork Foods! If you don’t know Spork Foods, you should cause they are awesome. I cashed in the gift certificate for their Delicious Seduction-Aphrodisiac Cuisine Class on Valentine’s Day, and I, of course, brought the hubby. 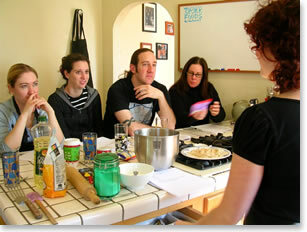 Jenny Goldberg along with her sister Heather run Spork Foods and cater and teach classes. Jenny taught the class and cooked some amazing dishes for us. Classes are held in their adorable Silver Lake abode with a kitchen I would die for. I have some serious kitchen envy. It was delicious and so filling and made my hubby smile ear to ear. Jenny even inspired me to make my own seitan at home, which I’ve been dying to try, but have been scared to make (just like bread, and I got over that fear). I’m definitely excited to try another class!